Just as unearthed anthropological artifacts suggest the values and behaviors of the ancient peoples who made and used them, our behavioral patterns signify our own buried stories. Our stories are older than we are. Some of what contributes to our personal stories resides in our DNA, which delivers to us a non-linear, species-wide conditioning. Some comes more linearly from our ancestral heritage. Some contributions are directly familial. The rest of our story forms gradually, as we assume to know who we are by having gathered input from authorities, friends and foes. Let us consider that, as children, we may have been told by a parent, teacher, or preacher that were lazy, inattentive, or a sinner. If, at that time, we believed the adults who made such comments (and why wouldn’t we if they were our trusted guardians? ), it is as if they put a spell on us. We would proceed from then on, automatically, unconsciously living our lives under a blanket of impositions placed upon us by those who were careless care-givers. If our old tapes tell us we are a victim, we will routinely feel victimized. If our tapes make us believe we are unworthy, we will have a hard time trusting those who offer help. Why is it so commonplace that a person who manages to get out of an abusive relationship soon enters into another one, just as bad or worse? Fortunately, story preservation happens also when our stories are positive. Those who were raised rich and lose all their money will often find a way to regain wealth. People who grew up valuing their fitness will work their way back to health after traumatic injuries. A person who is hooked on the ‘high’ of risking life and limb for extreme adventures will continue doing so even after having a terrible accident. Adults who were loved unconditionally as kids, and told they could do anything and be anyone, move confidently in the big, busy world, side-stepping obstacles and rarely taking insults personally. There is a link between how we feel, when we feel like ourselves, and the stories we believe about ourselves. We identify ourselves with our story. We do not know who we would be without our story. We gravitate toward whatever affirms our narrative and we avoid whatever conflicts with it. Human animals have the evolutionary advantage of backward-thinking memory and forward-thinking imagination. By default, we are prone to remember and project our stories. Our stories are our personal paradigms. Like a fish who knows not she is immersed in water, we are usually unaware that we are swimming in stories of preconceived ideas. Even less do we know our purposeful self/soul. Regardless, we are motivated to justify our limits and validate our stories through our daily experiences. Perceptions, interpretations and reactions are all unconsciously directed by chemicals that course through our bodies and compel us to enact roles we never chose for ourselves. Inherent in all of us is the necessity to maintain homeostasis of our temperature, pH and metabolic functions, etc. Translated, this word breaks into two portions: homeo means alikeness, and stasis means constancy. The body operates on the assumption that if we have survived up until now, that we should henceforth continue doing the same things in order to continue surviving. When our cells Need water, our body chemistry makes us Want water. When energy is Needed, our body chemistry makes us Want carbs. When specific nutrients are needed our body chemistry unwittingly makes us crave, obtain and eat foods containing whatever specific vitamin or mineral we lack. Chemicals compel us to satiate ourselves. Our bio-chemically-driven, emotional Wants drive our whole body into action on behalf of its parts, our cells, which cannot on their own migrate over to the sink for water, or to the fridge for food. Clever! We accommodate with little argument. Just as homeostasis emotionally motivates the acquisition and allocation of our resources, it guards our well-worn stories and warns us with aversions against changing them. When something challenges our beliefs or our personal identity, the same bio-chemical/emotional system that keeps our body in balance, immediately prompts us to take action to rid ourselves of the discomfort. 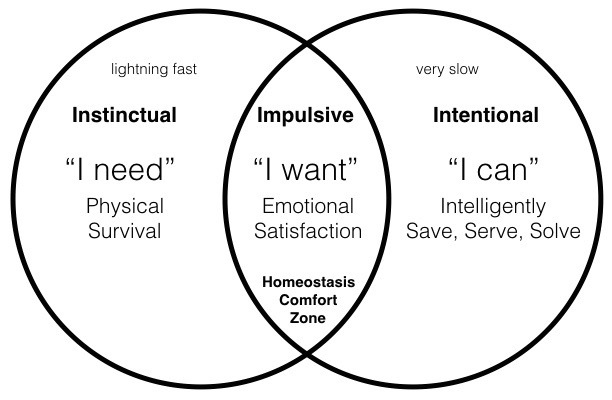 Even if we intellectually desire a specific change, our intentional behaviors (right crescent below) have a hard time competing with our lightning fast instincts (left crescent) and powerful emotional appeal of our comfort zone (central overlap). Homeostasis keeps our mindsets firm and our stories straight. When it comes to possessions, where is our comfort zone? If our story says that we can never have enough, we would be coming from a fear of Deficiency and we would be comfortable only when we have more to show and tell than most of our peers. Our comfort zone will keep us in Sufficiency if our story says that we come from proud hard-working middle-class people, so every time we want for something we should look around and see how many people are worse off. If our story says that we always have more than enough, we are comfortably Efficient and happy to share whatever we have with others. What kind of relationships are familiar and comfortable? If our story says that relationships are work, and they are usually disappointing in the end, the nature of our own relationships will likely fatigue us and fail. In Deficiency, we take comfort from knowing we guarded and withheld ourselves from the one who would have deeply hurt us. If our story says that relationships are for life — you must tolerate and accommodate Sufficiently to endure, our comfort will be from the fact that neither partner leaves for something better. If our story is that a relationship is an exciting way to explore and expand the practices of give and take, and it offers challenges that evoke spiritual development, then our comfort level will be in Efficiency, having deep and diverse experiences with someone to whom we give our heart and for whom we have patience and tenderness, especially in times of need. What level of know-how and self-reliance do we accept as comfortable? If our story says we are slow-minded and that power lies beyond us, we laze around in Deficiency, waiting and wanting rescue. If our story says we are average and cannot expect to be perfect, we find it Sufficient to make do with what is readily available. If our story says we are intelligent, capable, and creative, we will be most comfortable caring for others, proactively fixing and enhancing things, and Efficiently designing functional structures and operations. Our lives are complex. As the answers to the three questions above illustrate, each of our multiple interactive aspects may have its own comfort zone. In one aspect of our lives our comfort zone may be in Deficiency. In our physical aspect, we may be in pain and Need medications, yet we are Surviving. In another aspect we may be comfortable in Sufficiency. Financially, we may be Satisfied having hopes and dreams without ever realizing our greater Wants. While in another aspect our comfort zone may reside in Efficiency. Spiritually, we may have cherished memories; we Serve others in need; within our means we Solve problems as they arise. Recognize how stories have determined your comfort zones. Seize the opportunity to use Quadernity’s goal-setting process to install a new story that will serve your highest purpose. A simple truth is a truth where the opposite is not true. A deep truth is a truth where the opposite is also true. If our goal is not relevant to our current story, no matter how fervently we follow a strategic plan, we will fail to achieve or sustain our supposed desires. If our current story is not relevant to the Truth of our Being, no amount of supplication to Spirit will land us in the lap of a life without strife. A deep truth pertains to our goals, even those derived from opposite motivations (ordinary or extraordinary). Goals are achievable, sustainable and fulfilling only when they are congruent with our highest purpose and derived from our authentic I Am.